In the litany of kubba varieties, this one is our absolute, hands-down favorite. It's also known as kubba hummus, since chick peas are the defining ingredient. The sauce is a rich but light-colored lamb broth with tender, delicious chick peas, seasoned simply with onion, salt, and pepper. Mama showed me how to do this in April of '06 when we visited my in-laws in the Middle East. Since then, I've interviewed her, Aunty Seta and Aunt Suad at length about what goes in and what stays out, then gone out on a limb and experimented on my own. So far, according to the Scientist, this version is closest to the way it's supposed to be. Surprisingly (or not surprisingly, I can never be sure) around here, we prefer traditionalism to fusion. Go figure. Anyhow, let's get cooking! Soak the chick peas overnight. Drain, then place in a large stock pot with fresh clear water, lamb and onion. Bring to a boil, then reduce heat and simmer for an hour or so. Add salt and pepper and simmer another 10 minutes. Taste broth and adjust seasonings. 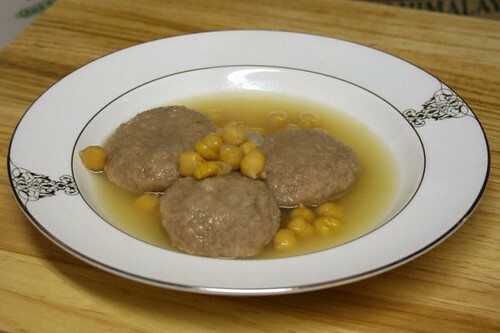 Return to a full boil, drop in the kibbe (about 12 at a time), and cook on high until they rise to the top of the pot, usually about 10-20 minutes, depending on their size. Boil for at least 5 more minutes, until the kibbe are fully cooked. Accompany with a green salad and raw white onions. Serves 3-4. Add salt to beans (chick peas and the like) after they're completely cooked. Otherwise, they just won't soften, even after hours of boiling. I think it has something to do with osmosis. Ask a biologist. Hmmm...speaking of biologists, I think I'll call my sister Grover (not her real name)! P.S. If you prefer a leaner broth, make the sauce the day before and refrigerate it overnight. Before boiling the kubba, skim off the fat and re-trim the lamb. There was oncee a good cook who told me a lot of good things about cooking and life and she would have been so proud of you!